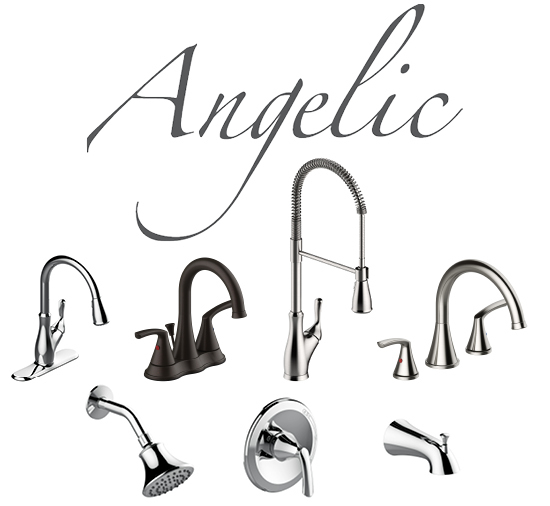 Angelic is a wholesale exclusive transitional style family that comes in Chrome, Stainless Steel, Brushed Nickel and Oil Rubbed Bronze finishes. It is the perfect choice for any wholesale showroom, remodeling project or new construction job that requires a quality high end design at a remarkably affordable price. All tub & shower, shower only and lavatory faucets are EPA WaterSense® certified and all Angelic faucets are California Energy Commission compliant. Angelic products feature ceramic valve technology and come with a lifetime finish and function warranty regardless of the application. Our pull down and widespread faucets come complete with a convenient quick connect feature that saves time and eliminates the frustration of working in tight spaces. All Angelic tub & shower and shower only trim configurations accept our existing 799 pressure balancing rough-in valves, with and without stops. Click here to view the full Angelic line.